A RESERVED SEAT is highly recommended for this show! Book early to get the best seats! Reserved Seating is all at tables, and it's a TWO STEP process. STEP 1. Purchase your Reserved Seat using The Spotted Mallard online ticketing system. STEP 2. Then email The Spotted Mallard on reservations@spottedmallard.com and make your table reservation. Your reserved seating tickets need to be attached to a table with your name on it - do don't forget to email! Table bookings typically range in size from 2 people right through to 10-12. Once you have purchased your Reserved Seat tickets, simply email the Spotted Mallard to make your table reservation. Book early for the best tables! General Admission ticket holders cannot reserve their seating or reserve a table. However, any seating that remains after all Reserved Seating has been allocated, can be taken by General Admission ticket holders on a first-come first-serve basis on the night. The Spotted Mallard is a brilliant place to have a meal. Whether you have a Reserved Seat or General Admission Ticket, you can order a meal before the show from our dinner menu. The Spotted Mallard, 314 Sydney Rd, Brunswick. Master guitar player Tony McManus has both extended and transcended the parameters of contemporary Celtic music. He has just been listed as one of the 50 transcendental guitarists of all time by Guitar Player Magazine. He is visiting as a guest of the prestigious 2018 Adelaide Guitar Festival, and while he is here we are delighted to present his only Melbourne show - in Brunswick, of course, where he has been a frequent and much loved visitor over many years. While Tony is known as a soloist, his frequent collaborations have always been a significant part of his work. The show will also feature collaborations with Melbourne based Scottish singer Fiona Ross, and fiddle and guitar player Julia Toaspern, a native of Berlin and a highly successful musician in her own right. Tony McManus will present a full concert set, which will also feature guest appearances from fiddle and guitar player Julia Toaspern. Julia is a multi-talented musician from Berlin who combines classical training on violin and voice with a wide interest in genres such as jazz, baroque and traditional music. 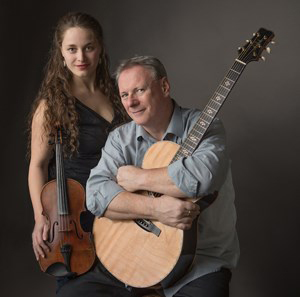 .and actually, several duos in one: from powerful, interwoven guitar duets to traditional, classical and self-penned songs and soaring fiddle sets  always delivered with passion, commitment, and an enjoyment of music that is contagious." The Melbourne-based Scottish folk singer Fiona Ross will open the night accompanied by Tony McManus, featuring songs from their recently released album Clyde's Water, a superb example of the traditional style, bringing together Fiona's honest, evocative singing and Tony's unrivalled playing. Tony McManus is a master guitar player who has both extended and transcended the parameters of contemporary Celtic music. Ranked by peers and predecessors alike alongside the guitar worlds all-time greats, (English guitarist John Renbourn described him as the best Celtic guitarist in the world.) his fiendishly dexterous, dazzlingly original playing draws on traditions from the entire Celtic diaspora  Scotland, Ireland, Brittany, Galicia, Asturias, Cape Breton, Quebec  along with still further-ranging flavours, such as jazz and east European music. Long applauded for his uncanny ability to transpose the delicate, complex ornamentation characteristic of traditional bagpipe or fiddle tunes  even the phrasing of a Gaelic song  onto his own six strings, McManus is increasingly being acknowledged also as a pioneering figure in bridging the realms of Celtic music and other guitar genres. its PERFECT! - Tommy Emmanuel.